Samui Summit Villa nyder den bedste udsigt på hele øen. 180 graders 'over himlen' uforstyrret udsigt over bugten Thailand, Samui selv, og fjerntliggende øer. Det aspekt er stik vest, hvilket sikrer et postkort solnedgang hver aften. Dette synspunkt, der ydes fra hver af de store Repræsentationslokaler, hvert soveværelse og faktisk hver badeværelse! Villa foreskriver meget ekspansiv leve med 2 stuer, indendørs (12 personer) og udendørs spisning (10 personer), TV / Medier værelse, sala, have på hvert niveau, pool bar, pool område med liggestole, parasoller mv, veludstyret køkken og 6 aircondition soveværelser (5 ensuite). To af disse er master soveværelser. Jo større har 850 sq ft (80 m² MTS) af opholdsstue med fantastisk bad, udendørs have med bruser, privat udendørs have. Den anden pulje mester har sin egen have. Soveværelser 3-5 soveværelser er twin / dobbelt og alle foran deres egen have. Soveværelse 6 er en dobbelt aircon værelse. Hvert ensuite soveværelse har 180 graders havudsigt, og 4 af de 5 ensuite badeværelser har udsigt til havet også. Vi holder 2 gode sæt højrehåndede golfklubber på stedet til gæstebrug på den vidunderlige Santiburi Golf Club (Asian Tour Stop og et af de mest fantastiske naturskønne baner i verden), den udfordrende Royal Samui Golf Club, 9 Hole Bo Phut Hills og Samui Driving range. Alt vi beder er, at du supplerer ammunitionen (golfboldene du mister!). Vi holder 2 tennisracketer og bolde til hotellets gratis tennisbane. We stayed at the Samui Summit Villa last week. It is the most relaxing place I have ever been. The pool is so beautiful you could lounge all day having massages and eating the freshest tropical fruit in the world. The villa is spotlessly maintained and furnished to the highest standard with all the modern amenities should you need them. The bedrooms are spacious and comfortable and if you need it the air conditioning is a blast. My third visit to Koh Samui and definitely the best. “The most incredible villa we've ever stayed in." From the moment we arrived at Samui airport it was 5* service from then on. We flew from Brunei where we are living and only a few hours on a flight. We were met by Frederick at the airport from May Car Rentals with our hire car and he dropped us to our Samui Summit Villa which was only a short journey through the lovely bustling streets. The Villa is situated in Choeng Mon. It was absolutely spectacular with the most incredible views of Samui. The villa is bright and airy and extremely comfortable. My favourite thing about the villa was the large infinity pool which i could have stayed in all day. Total relaxation and plenty of sunloungers to catch the rays. There was also a Sala for in-house massage beside the pool in the open air which we booked and it was so private and excellent by a local Thai lady. The accommodation was second to none. Beautiful attention to detail with the interior design and very comfortable beds. The outdoor shower leading out from our ensuite was divine! I can't recommend this villa highly enough and its staff. Andrew the manager of the villa was extremely accommodating and helpful. Ning cooked the most delicious breakfast for us every morning and kept the villa sparkling while we were there. This villa was in a perfect location, close to every amenity and we couldn't fault one single thing! I'd be back in a heartbeat. We had the privilege of 4 day stay at this villa just before Christmas. We are a family with 4 kids aged 12 - 8 and this villa is perfect - with plenty of rooms to spare! Samui Summit Villa is an oasis of calm with the infinity pool deck the perfect place to enjoy it. All the amenities of Koh Samui are a short drive away, with many of our favourites being in the local area, Bophut, Fisherman's Village etc. Accommodations in the villa are beautifully designed and very well maintained. The staff that manage the villa are professional and courteous and will never impose on your valuable holiday time. The maid service is lovely and it would be a mistake to come to this villa and not have the chef cook for you - especially the amazing home cooked local dishes. The Villa Manager is close to hand to help with anything that might arise from a maintenance issue to helping you hire a car, or tell you where to shop. Many services can be arranged in advance with the owners of the property including grocery shopping to be available on arrival etc. We thoroughly enjoyed our trip to Koh Samui but the highlight was family time around the pool, especially at sunset. We really didn't want to leave and will definitely return. We stayed at Summit Villa for a brief spell during a family holiday. We found the space and layout of the accommodation exceptional. 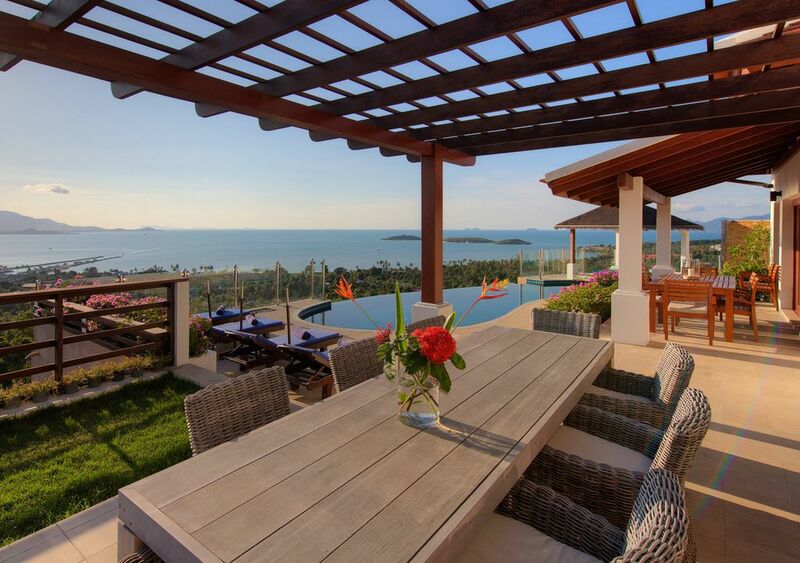 The exterior (infinity pool, patios and garden) gave every opportunity to enjoy this spectacular location. The property would accommodate large groups.- our 2 families (4 in each) barely touched the sides. We were given every help and assistance to enjoy the villa and surrounding area.. Fantastic! Wish we had allowed more time for Samui. We were a group of students and stayed at this villa for a week. Word can't even express how beautiful the view is it was simply amazing and we loved how opened the rooms in the villa were. Andrew and Ponty also helped us a lot! Andrew helped us organise an enjoyable fishing trip and gave us great advice on places to visit. The included breakfast was very convenient and we particularly enjoy Ponty's delicious Thai food. Ponty even helped us out when the driver was unavailable and drove us herself. We all loved our stay and if we return to Samui we will definitely book this villa again! We stayed at Samui Summit for a week with our small children and another family of 5. The villa is so large we truly could've fit a 3rd family! Everything from the house, to the staff, the activities and the delicious food made our vacation a success. The staff is really what makes this place even more magical. Who wouldn't want a vacation with a breakfast staff who cook and set up breakfast, clean up and then clean the rest of the villa? Andrew is like concierge and the best part is that he is a native English speaker. He booked our activities, stocked our fridge, recommended restaurants, managed and directed the other staff members, and helped with babysitters. He even arranged for our rental car to be at the house waiting for us and when we left, there wasn't any need to drop off the rental car - he took care of it. Ahh bliss! As other reviewers mentioned, Ponty, his wife cooked us dinners and it was incredible. Truly incredible. I would recommend Samui Summit if you want a vacation where you feel taken care of and like to kick up your feet and enjoy the stunning sunsets. We made some great memories with our family and friends. Choengmon har en smuk sandstrand inden for en kilometer fra vores Villa, med en ubeboet ø at svømme til og vandscooter etc. Restauranter langs stranden har gratis liggestole og parasoller til de besøgende, der tager deres drinks og / eller frokost der. Villa har udsigt Plai Laem og Big Buddha templer, og mange af vores gæster gør daglige besøg til den omfattende tempelområdet nedenfor med forskellige kulturelle og sjove ting at gøre der, daglig fortunetelling, ceremonier, børnetøj spil, og munkene er meget venlige og engagerende. Choengmon har flere restauranter, mini-golf, unikke fodbold golf inden for de palmelunde, fitness fitnesscentre med billig ugentlige medlemskab. Lokalt tilgængelige thailandske madlavningskurser er populære, og der er 3 golfbaner, med den asiatiske Tour selvfølgelig Santiburi, en af ​​de mest spektakulære baner i Asien inden for 20 minutter. To sæt golfkøller er på villa til dit brug. Inden for 3 minutters gang er en privat tennisbane, med gratis brug for villa gæster. 10% gratuity is a Service Charge Service Charge 10% gratuity.